This painting, The Woman behind the Veil, is one of my favourites. Many Muslims and others, aren’t always sure whether the “veil” refers to the face covering or the head covering. In this painting it is both. The ink and bleach rendition is inspired by the controversy that the veil has caused in the world of late. In France the veil is banned in public and in Spain there is a debate about whether to follow suit. This debate extends from government caucus groups to university classrooms but, interestingly enough, does not include women who veil…what value could they possibly add to the discussion? 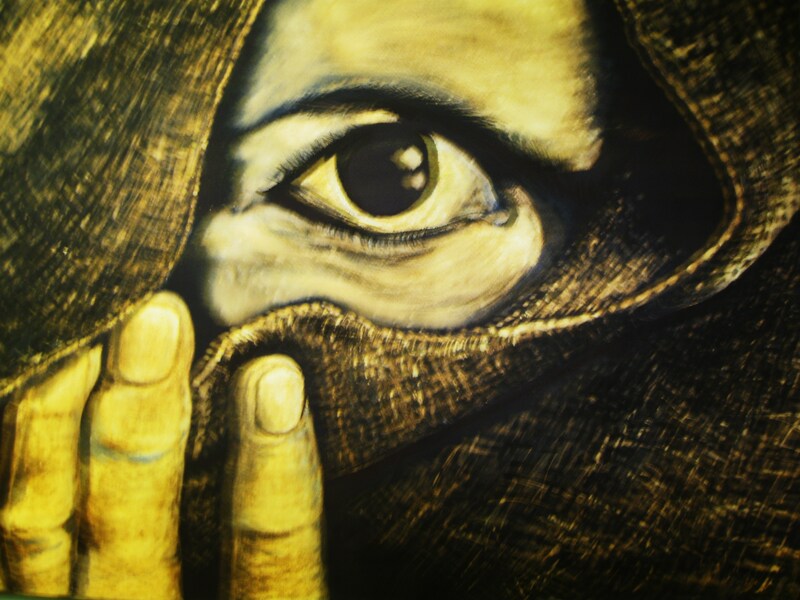 But the painting is titled The Woman behind the Veil. Despite the intrigue, the mystique and the controversy created by the veil, it’s the woman that I want to focus on. So often, veiled women are boxed by men and other women in so many different ways. Generally she is seen as oppressed, inhibited, restricted…probably by her father or husband. To many, she is not seen as very intelligent, but she can probably cook well. She must be very conservative and unimaginative – why else does she resist fashion trends? And she’s probably subservient, voiceless and weak…or she would “free” herself, surely. You don’t see her strutting her stuff on the beach or the catwalk so she can’t have great self esteem. For Muslim women who don’t wear the veil, she is often regarded as holier-than-thou, righteous. Although this is changing very slowly, as we enjoy an age of televised veiled women marching for freedom in Palestine, protesting in Tahrir Square and speaking from university podiums, I still find that there are many people who avoid eye-contact with veiled women in the streets – especially those dressed in black- in the same way that they avoid really seeing disabled people, beggars and the homeless. As if there is something alien about them. What is it about them that begs invisibility? What is it we don’t want to see? And if we got beyond our tainted glasses, gave up our assumptions and got curious, what would we ask The Woman behind the Veil? It’s her I’m interested in. Aren’t you? What does she do? What is she passionate about? What makes her laugh? What does her heart yearn for? Where has she travelled? What does she dream of? What cause does she fiercely champion? Who does she vote for? What are her fears? Who are her friends? Why does she wear the veil? There’s so much to be curious about…And what of the world she’s looking out at? How does she see it? At a recent conference I attended, Fadil Soloman, a well known interfaith facilitator, posed these questions in a different way through a visual comparison. What if we looked at veiled Muslim women as we look at the most honoured of women in Christianity…would that make a difference? Would we see them as women who love God, women who serve their communities, women who change the world? Wow. With each new post , I’m inspired to just ‘Do Something’. I’m particularly draw to this one , as a woman behind the veil ,myself, it gave me some perspective.I don’t believe I’d realised it , but up until now , I’d been quite myopic in my view of others. I’d been so focussed on the light I wanted to be seen in , I hadn’t thought of the light I shon on those around me. This blog has been a brilliant means of stimulation. Thank you , I will continue to desire to be discovered , without being uncovered. Thank you, Mahjooba. I like that you’ve commented with that name since it literally translates to “veiled one” from Arabic. I’m glad that you got a fresh perspective from this post. You make a really good point that we need to view veiled women differently than we currently do, and perhaps seeing them as we see Mother Theresa and the likes, might be a good starting point. much clear idea on the topic of from this piece of writing. Thank you. I small so happy to hear it made a difference to hours. Sometimes we need simply be willing to look at things differently.